The first thing that you should master post flop is the correct c-betting strategy! Let’s do this together. Do you want to know when to C-bet IP and OOP? What hands are good to check back and when you should do it? When should you be barreling when you C-bet on later streets? How to balance these ranges and keep your opponents guessing? How to exploit villain mistakes and weaker players? If yes, then this is a must see! Take this course and eliminate mistakes that you are doing! How to balance your ranges! 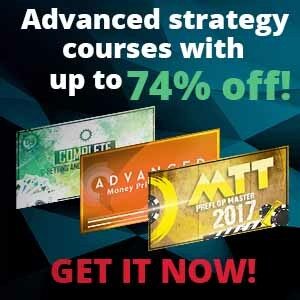 This course is the best value money can buy! 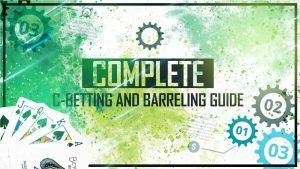 The continuation bet is one of the areas where almost everyone makes a lot of mistakes and understanding how to avoid it and tune your strategy to maximise winnings is the first thing you should do. We will cover everything you need to know, we will categorise hands into groups that will make your decisions much easier when you understand how to play it. So you will know when you should be C-betting and probably even more importantly when and what hands you should be checking back. Moreover, we will learn how to changed that when you are IP and OOP and on different board textures! In addition to this, I will take examples and break down all my ranges putting every single hand in one of the categories so you will see complete view how it should look in practice and how you need to balance your ranges! Wait no more, learn this and start crushing your opponents without mercy! Do I need to C-bet differently IP and OOP? Yes, because when you are OOP it is much harder to protect your range. So I will show you what hands you should be defending IP and OOP and how these ranges changes! Will I know when it is good to be c-betting and barreling on later streets? Yes, we will cover not only when to C-bet flop, but when to continue bet on the turn and river as well so you will know how to play there! Why I need to balance my ranges here? Because you want to protect your checking range. If you bet all strong hands you end up folding every time when you do not C-bet and this is a way to disaster. Understanding what hands I should c-bet and what hands I need to check was one of the most important things in learning poker strategy and becoming a winner! Highly recommend this to anyone who wants to improve their game! I knew that I need to check some stronger hands, but this strategy turned that around and showed how to do it. Now it is very clear how I should play and no one can exploit me because I just crush them! This is perfect! Before this course, I was guessing all the time if I should bet or not and getting this straightened out is invaluable. Furthermore, after fixing this my win rate improved at once! What else I can ask for. Now I know when to c-bet on the flop and continue betting on later streets or when to check in every spot, I just can’t imagine how it could be explained better than this.